Cosmic Fortune, an exciting alien themed Net Entertainment (NetEnt) slot, challenges players to win one of five jackpots, three of which are progressive. 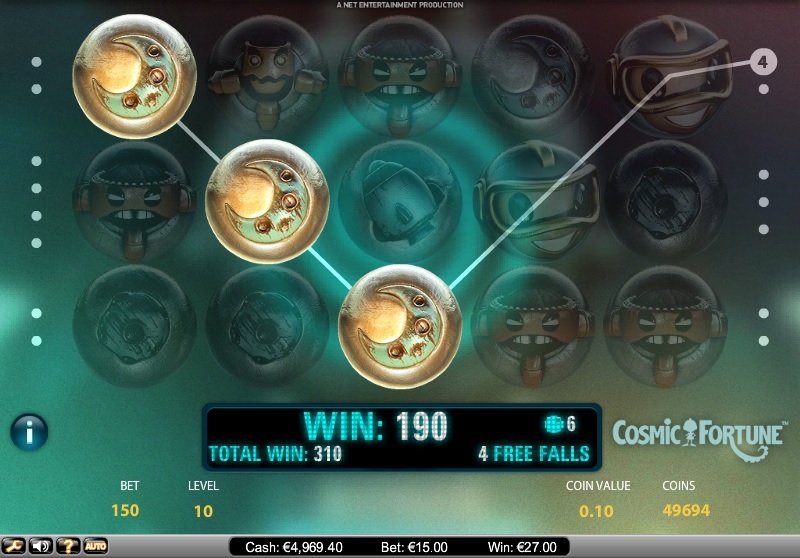 In spite of its lucrative bonus features, Cosmic Fortune is played the same way other NetEnt slots are played. Players have to activate as many paylines as they please and bet up to 10 coins per active payline. The coin values range from $0.1 to $0.5. Players can bet a maximum of $75.00 per spin. Although slots based on the themes of outer space and aliens are not new, NetEnt’s Cosmic Fortune stands in a class of its own. Its graphics, imagery, background music, audio effects, and animations can give players the feeling that they are travelling in outer space, interacting with a variety of aliens and coming across spaceships and unknown planets. NetEnt says that it wanted Cosmic Fortune to be an action-packed journey in space, blending the latest technology with old action games. In keeping with its theme, the reels feature icons of spaceships, strange planets, and aliens. Cosmic Fortune is the first NetEnt slot that challenges players to win one of five jackpots, three of which are progressive jackpots. In addition, it comes with the innovative Avalanche Feature and a free spins round. Whenever players create a winning combination, the symbols in that combination will disappear and the spaces created will be filled with symbols falling from above, giving rise to more avalanches and more wins. A marble symbol with an S printed on it serves as the scatter. This icon pays even if combinations of it do not land along an active payline. If players get at least three scatter symbols anywhere on the reels, they will receive 10 free spins or free falls, as they are called in Cosmic Fortune. Players can win five more free falls for every scatter they land during the free spins round. Every marble scatter players land on the screen will be collected and used in the Free Falls Bonus Feature. During the Free Falls Bonus Feature, the marbles collected are allowed to fall from a spaceship into a variety of cups at the bottom of the screen. If they fall into coin win cups, players will win cash prizes. If three marbles land in a jackpot collector cup, the jackpot game is activated. In the Jackpot Bonus Game, 50 marbles are dropped from a spaceship into coin win cups and jackpot collector cups. If three marbles land in a jackpot collector cup, players will win the fixed or progressive jackpot associated with that cup. Cosmic Fortune can be played at any NetEnt online casino for fun or real money. This is one NetEnt slot players just cannot afford to miss.